UPDATE: Armour launches Conran-designed dock for iPods and iPhones | What Hi-Fi? 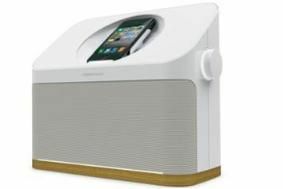 This Speaker Dock designed by Sir Terence Conran has just gone on sale for £250. Initial details emerged last year (see original story below), and UK distributor Armour Home says the dock is available now – in black or white – "for immediate delivery". The Conran Dock uses advanced aptX Bluetooth for audio streaming, which is said to offer superior sound quality from aptX-enabled devices. These include all Apple Mac computers running OS X 10.6.4 upwards, the Creative Ziio tablet and forthcoming Samsung portable devices. Armour Home has joined forces with design guru Sir Terence Conran to launch a new designer audio brand, Conran Audio. The first product, a £250 Speaker Dock, combines Studio Conran design with audio engineering from Q Acoustics, and has both a physical iPod/iPhone dock and Bluetooth connectivity with A2DP and apt-X compatibility. The new model, which will be available in both white and black, will go on sale in February next year, and uses two 7.5cm bass/mid drivers and a pair of 30mm tweeters, driven by a 2x15W amplifier. The dock assembly will rotate, allowing iPod and iPhones to be mounted vertically or horizontally, and the Bluetooth is designed to allow music to be streamed from other devices, such as the iPad. Six audio equalisation presets are provided, and these can be selected from a remote handset which fits into the side of the unit when not in use. Sir Terence Conran says that the Speaker Dock 'is a dedicated 100% pure music player, that works with docked iPhones and iPods or wirelessly with Bluetooth enabled devices such as the iPad, allowing you to select songs from the comfort of an armchair or, if it's your thing, while dancing around the room.